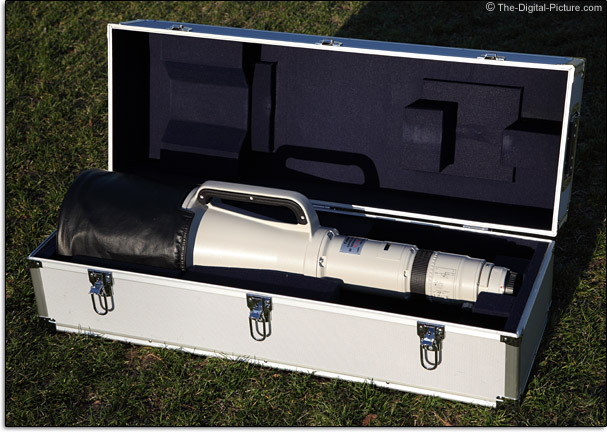 Welcome to the longest and perhaps the rarest full autofocus lens in the world - the Canon EF 1200mm f/5.6L USM Lens. Of all the lenses Canon has produced over the years, maybe none have the mystic and intrigue that the now discontinued 1200 L has. So when B&H Photo called to invite me to review this lens, I of course said "Yes!". To get started, here is a short B&H-produced video featuring the Canon EF 1200mm f/5.6L USM Lens and B&H maven Zevi Slotkin. 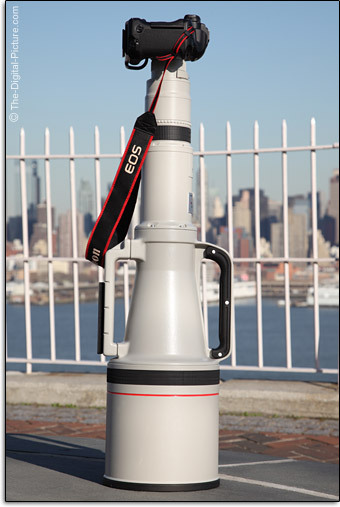 The predecessor to the Canon EF 1200mm f/5.6L USM Lens was the Canon FD 1200mm f/5.6L manual focus lens. The FD 1200 was first seen at the 1984 Olympic Games in Los Angeles, CA, USA. Chuck Westfall of Canon USA was there and remembers that "5 copies of the original FD 1200mm f/5.6L lens were brought to L.A. and used for newspaper, magazine and wire service coverage of the Olympic Games." Mr. Westfall indicated that "All of the FD mount 1200mm f/5.6L lenses were eventually shipped back to Japan, and at some point in the late 1980s, they were converted to EF mount" resulting in the lens model I am reviewing here - the Canon EF 1200mm f/5.6L USM Lens. The new EF 1200 was then marketed by Canon in July, 1993 with an annual production volume of around 2 (that's right - "two") lenses. The EF 1200 L was available by special order with lead times running about 18 months. The price? If you need to ask ... you can't afford it. The original price was 9,800,000 yen - that was MSRP $89,579 in the USA. And "no discounts" according to Mr. Westfall. The model I reviewed (in excellent condition) has a $120,000 price tag hanging on it. That's right - it costs more than a small house in the country. The two standout features of this lens (in addition to the price) are the size/weight and the focal length. Let's start with size/weight. At over 3x the weight and nearly 2x the length of Canon's largest current production lenses, the Canon EF 1200mm f/5.6L USM Lens is simply huge and heavy. 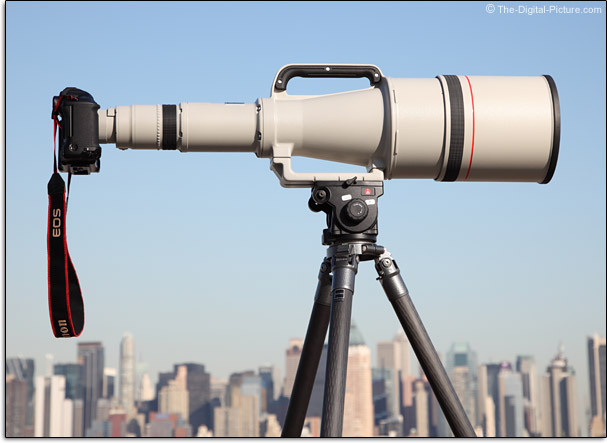 The 1200 L above is shown behind the itself very large Canon EF 800mm f/5.6L IS USM Lens. Even with this 1200mm-size-reducing perspective from a 105mm lens, the 1200mm lens appears huge. While one person can mount the 1200 L on a tripod, two people make the job significantly easier and far less risky. Don't even think about handholding this lens. Even if you were strong enough to hold the lens up, the balance point of the tripod foot is too far away to reach for support purposes. Holding behind this balance point makes the rig far too front-heavy to balance. So, plan on needing a solid tripod. 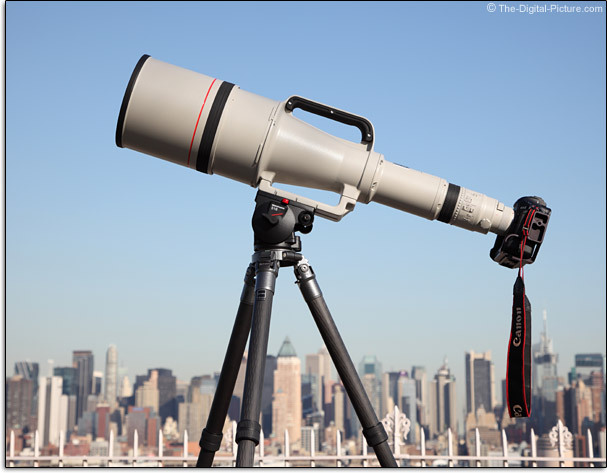 The Canon EF 1200mm f/5.6L USM Lens is shown above with a Canon 1Ds Mark III DSLR mounted to it. When the lens is this big, you mount the camera to the lens - not the lens to the camera. :) The 1200 L above is mounted on a Manfrotto 516 Fluid Head and Gitzo GT5540LS Carbon Fiber Tripod. Build quality is what you would expect from a Canon Super Telephoto Lens - it is solid. This lens is bolted together like the rear end on a 1-ton 4x4. Want to attract attention? This size and design of this lens invites it like no other. Those foreground shadows above are not mine. All lenses have a barrel, but this one adds a military rifle-like top handle. Though very useful, it only makes this lens look more like a scrutiny-attracting weapon. 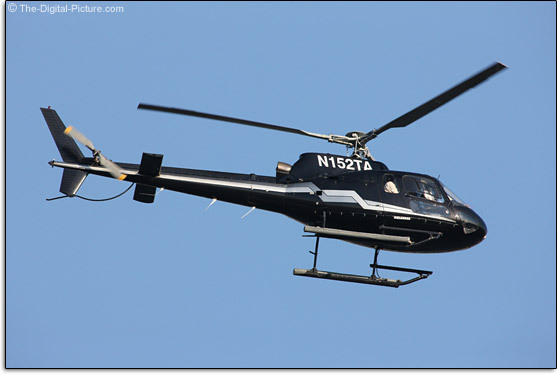 Are there always that many helicopters flying over the Hudson River in New York City? Or were they watching me? This lens will require a custom-sized camo Lens Coat for covert operations. At least the helicopters provided good "Lens Food" (subjects). Though not too stressing on the AF system, these helicopters did provide decent AI Servo targets. The 1200 L tracked these BIF (Birds in Flight) without a problem. I was not planning for this shot and I should have used a slower shutter speed. 1/500 would have been a better choice to show blade motion blur. The relatively fast shutter speed I was using was for the walking human model I was shooting at the time the helicopter came through. AI Servo functioned well in this task as well. The other standout feature I mentioned was the focal length. 1200mm is really long. The extremely narrow 2° 05' full frame angle of view is so narrow that this lens practically needs a finder scope. Since the 1200 L is also compatible with the Canon Extender EF 1.4x II and the Extender EF 2x II, incredible focal lengths of 1680mm (f/8 max) and 2400mm (f/11 max) are obtainable. While I had my extenders along, time did not permit testing with them. The 1680mm and 2400mm focal lengths shown in the comparison below are simulated. Let's review some focal length comparisons. To start, here is a loosely-cropped 800mm full-body portrait and the 1200mm equivalent. Impressive. This is not even a full body portrait at 1200mm, but the subject is far beyond reasonable conversation distance. I had to use hand signals to communicate with her on this windy day. 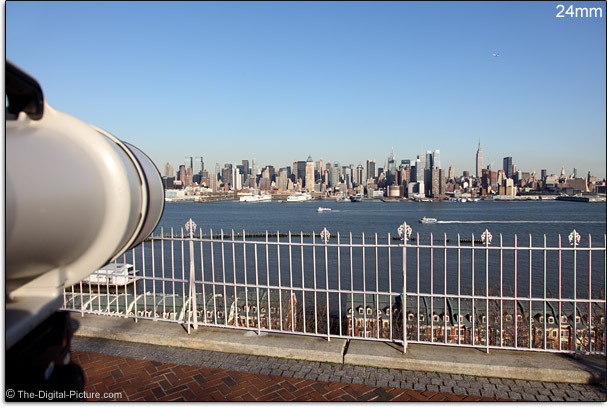 Our position for all of the photos found in this review was in Weehawken, NJ - directly across the Hudson River from Manhattan. The distance directly across the Hudson River to the end of piers was about .8mi and it was about 1.0 mi to closest building fronts. Hopefully these comparisons start impressing upon you how narrow the field of view is from this lens - and this is from a full-frame body. The 1200 L supports all EOS bodies which means an APS-C body such as the Canon EOS 50D or the Canon EOS Rebel T1i/500D on the back of this lens would deliver an angle of view that is noticeably narrower yet. Using a Canon EOS-1Ds Mark III, faces were recognizable at distances up to a mile or more. A higher density sensor such as that in the 50D or T1i should extend this distance to an even more incredible number. But, subjects are not the only thing this lens magnifies. Vibrations are one unwelcomed magnification. With image stabilization enabled, the 800mm viewfinder remains motionless during use. 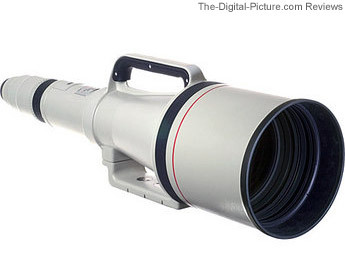 In contrast, the non-IS 1200mm L, with its very long physical and focal length and the long distance from the viewfinder to the tripod attachment point, provides a vibration-filled viewfinder. I felt the need to rest my left hand over the tripod mount to stabilize the rig (my normal super telephoto shooting position), but my arm didn't reach that far comfortably. I settled on a mid-way position, but didn't feel at ease with my hold. Dual tripods would be a great solution for a non-moving subject. You will notice that I kept the ISO setting relatively high for most of my sample photos. I did not have time to determine the minimum shutter speed necessary for sharp images, so I hedged with higher ISO settings and fast shutter speeds. Images with high ISO noise can be used (noise can be removed to some extent), but camera motion-blurred shots are typically useless. From an image quality standpoint, the Canon EF 1200mm f/5.6L USM Lens is a bit soft at f/5.6. Stopped down to f/8, this lens is very sharp. I didn't notice a significant difference in image quality between the center and the corners of the frame. Stopping down to f/8 delivers a noticeably brighter image as vignetting is cleared up at this setting. The image quality I found on close distance shots was not found on my distant shots. Most troublesome for the 1200 L from a distant subject image quality standpoint are atmospheric conditions. Haze, smog, smoke, thermal (heat) distortion ... all cause problems for these shots. We had a beautiful Spring day for this review, but along with bright sunlight comes heat distortion. This effect was very visible in all of my sample shots across the river. The 800 L did not fare much better in this regard. There is no noticeable optical distortion in images from this lens. That was helpful for this review as the straight buildings in the city were unforgiving for lens distortion (and rotational errors). Two crystal fluorite lens elements (3rd & 6th) (the ones that take a year to grow) are intended to eliminate the secondary spectrum. Some CA (Chromatic Aberration) is present starting mid-way to the corners as seen below. The 1200 L has an 8 blade aperture, but evaluating bokeh was not easy as everything not in focus is always a complete blur. It looks great to me. 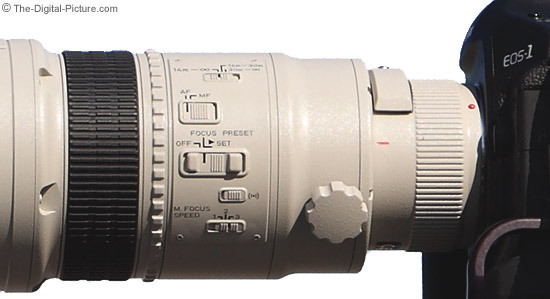 The Canon EF 1200mm f/5.6L USM Lens uses a Ring USM (Ultrasonic Motor) rear focusing system. This is a electronic focus-by-wire design that works very well. It is quiet and relatively fast. Focus hunting can be an issue with this lens. The shallow DOF means that focus must be adjusted to a relatively close-to-correct setting for the relatively small f/5.6 aperture to allow the camera and lens to quickly lock focus. Helpful is that the 1200 L provides 3 focus distance range settings (see switch below) that allow focusing to be restricted to 14-30m, 30m-8 and 14m-8 (full range). That's right - MFD (Minimum Focus Distance) is 45.9' (14.0m). This lens will not work well in most back yards. Visible below is the relatively small manual focus ring. I prefer this ring to be positioned over the tripod mount where my left hand would typically rest, but as I said earlier, this position is not practical with this lens. As I also mentioned, this is a focus-by-wire electronic focusing design - this requires the camera to be powered on for any focusing to function. Power manual focusing is very smooth and can be adjusted to 3 different speeds (see switch below) - 1 is for fine focus control while 3 is for fast adjustment. Like Canon's current super telephoto lenses, the Canon EF 1200mm f/5.6L USM Lens has a focus preset function for immediate focusing to a predetermined distance. Like most collared lenses, the 1200 L rotates while tripod mounted. What is unusual is that the tripod mount does not rotate - the rear of the lens rotates. See the friction control knob above? It provides friction control over the rotating narrower rear portion of the lens. It is a unique design that works well. A provided 48mm Drop-In Filter Holder can be seen on top of the rotating rear portion of the lens. A 48-mm Drop-in Circular Polarizing Filter is available. The 1200 L's lens hood is a very convenient and easy to use built-in design that locks closed and stays open well - but does not lock open. You will notice that the pics of the lens sitting vertically on the ground on this page all have the hood retracted. While the hood locks tightly closed, it does not lock open strongly enough to support its own weight. An open lens hood would of course have made the lens size appear even more impressive in these pics. The 1200 L shipped in a strong, padded aluminum case. The B&H model reviewed comes in an additional padded aluminum shipping case for additional protection. The included lens cap/hood cover can be seen in the open case above. It is similar in design to the other super-telephoto lens caps - well, not similar in size. It fits completely over an adult head (yes, I witnessed this antic). Who owns this lens? The actual owners list is not large but is not publically known. However, it is hard to use one of these lenses in public without being noticed - and becoming publically known. Reported owners include Sports Illustrated (owns two), Canon Professional Services (owns two) and National Geographic magazine. Broad categories of owners include governments (where this reviewed lens is rumored to have been sourced), law enforcement agencies, news and sports magazines, newspapers and wire services - and some wealthy individuals. Some of the most likely candidates have the word "agency" in their name. 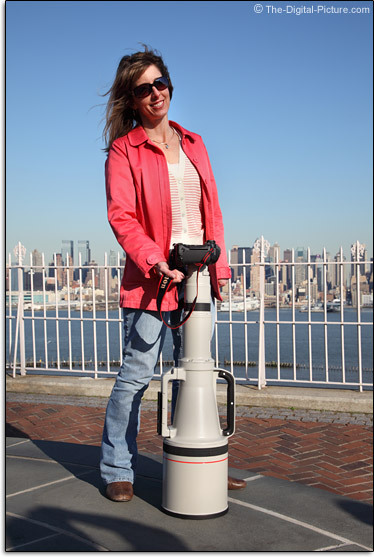 The next question is - Why do they own the Canon EF 1200mm f/5.6L USM Lens? When it is dangerous physically, dangerous to the goal (covert operations) or physically impossible to get closer to the subject, the 1200 L is the answer. Based on the categories of owners listed above, the specific uses become apparent. National Geographic? Wildlife. When approaching any closer may disturb the subject, use a 1200 L. Sports Illustrated? Sports. Shoot a baseball game from behind the outfield wall. Shoot soccer and football mid and down-field action from behind the goal line. Law enforcement and government? Covert surveillance. Remember - people are recognizable up to a mile or more with this lens. News agencies? Uses include war coverage and major event coverage that needs a unique angle (such as of the Pope from behind and above a large crowd). Of course, paparazzi and the infotainment industry fit in here somewhere. Some specific uses shared by Chuck Westfall include coverage of the Waco Massacre in 1993, various NASA space shuttle launches, Olympic games, Major League Baseball, World Cup soccer and Formula One motorsports. I know that after reading this review, you think you need one of these lenses. 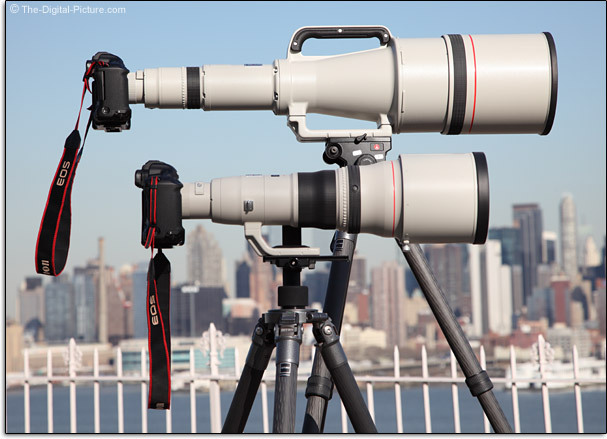 Being realistic, the Canon EF 800mm f/5.6L IS USM Lens is going to be the better option for most people. While obviously not as long in the focal length spec, the 800 is a better lens in most other aspects. It is sharper wide open, focuses faster, is smaller and lighter - and the Canon EF 1200mm f/5.6L USM Lens price makes the 800 L look like a bargain. After using and pouring over the results from the 1200 L, the striking attributes remain the size, focal length - and price. For those with unique needs (including differentiation in the marketplace), deep pockets and/or interest in the collector value of this lens, B&H's world renowned used department has an excellent condition Canon EF 1200mm f/5.6L USM Lens available at the time of this review. "By virtue of acquiring and offering not one but two of these rare 1200mm lenses within a year, B&H Photo, Video, Pro Audio once again loudly proclaims its dominance as the world leader and most trusted name in Photo, Video, Pro Audio and Electronics and the leader in providing a fair and honest marketplace for used products in the aforementioned categories to both buyer and seller alike be they Professional, Prosumer or Consumer." [H. Waldner / B&H] Impressive indeed. There may never be another opportunity, but my credit line says I have to pass on this temptation.